During the construction and testing of Gamera I, the team’s knowledge of ground-effect aerodynamics and lightweight structures was significantly developed. 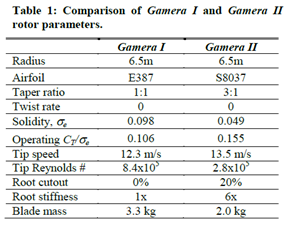 These lessons were applied to the design of Gamera II through a custom-built optimization code. This computer program simultaneously designed the blade structure and aerodynamics to minimize the power required from the pilot. 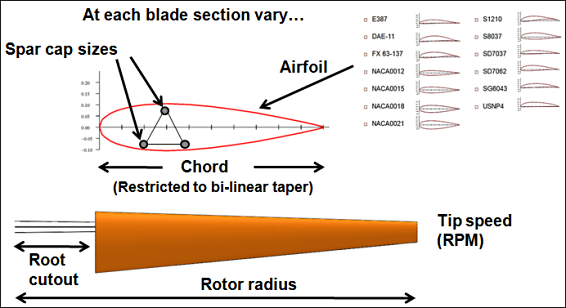 Blade taper improved both the aerodynamics and the root stiffness of the blade spar, keeping tip deflections low and increasing ground effect. 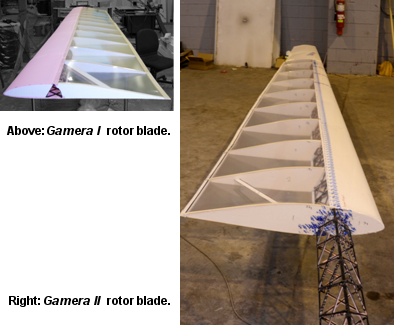 Additionally, through intensive research and experimentation efforts the structural weight of the rotor blade was significantly reduced compared to Gamera I, by 39% (22.7 lbs)! Result of the Gamera II aero-structural optimization trade studies. These results show the effect of radius, structural technologies, and manufacturing complexity. The Gamera I and Gamera II design points are highlighted. 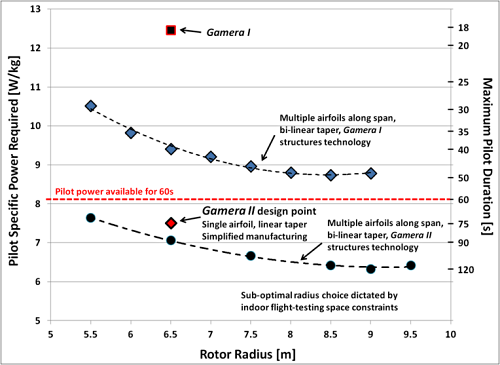 Power required is shown for rotor height of 60 cm (2 ft) above the ground. The 60-second duration flights will be flown as close to the ground as possible to increase ground effect advantages.